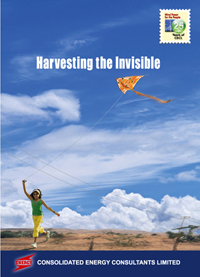 During 1984-85, a dream of 'making Wind Power a reality' began in India. Ideas moved as freely as the wind, people interacted at every level and the energy produced created interest all across the country. The core focus remained clean and renewable energy. The mission was to ensure sustainable energy security for the nation. This Brochure commemorates a 25-year journey of Consolidated Energy Consultants Ltd. CECL. Demand for energy - more particularly in the form of Electricity is proportionately increasing with growth in GDP. 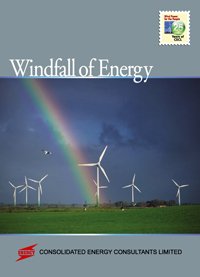 Perpetual availability of non-polluting electricity produced through conversion of wind flow as an alternative is a matter of keen interest for planners. With greater policy support, brighter future for wind clearly emerges. If we believe that 'nothing will stop the strength of an idea, of which the time has arrived' - we believe that nothing can stop the wind. will change and enrich lives of common people.